HUNTINGTON BEACH — Huntington Harbour’s fuel dock is closed – for now. Thousands of boaters at Orange County’s northernmost marina will have to travel to other harbors to fill up their vessels after Huntington Beach officials attempted to keep the fuel dock open. The dock’s owners — Center City Properties and Nahas Enterprises — carried through on a plan to close the fueling station by Oct. 1; city officials stated pending solutions were in play but a feasible plan was not executed in time. City officials recently became a player in the Huntington Harbour fuel dock saga after word came out the owners of Mariner’s Point fuel dock would shut down the station. The Huntington Beach City Council assumed an active role in preserving the harbor’s only fuel dock on Sept. 21. All seven elected officials supported a recommendation of Huntington Beach and Orange County partnering together to assume ownership of the fuel dock. City Hall issued a statement Sept. 23 informing boaters all options to ensure Huntington Harbour does not lose its fuel dock were on the table. Boaters were notified one week later of the fuel dock’s closure. Huntington Beach retained an environmental law firm to negotiate keeping the fuel dock open beyond Oct. 1; city officials also issued a Request for Qualifications on Sept. 29 to find a new operator. Council members held a closed session meeting Oct. 5 to discuss property negotiations. An environmental attorney was also retained to guide the city’s future action and prevent the dock’s previous ownership group “from abandoning and/or closing the fuel dock facilities in a manner that is not in compliance with very stringent environmental law, thereby creating a potential hazardous situation for the community and harbour,” according to a published statement. 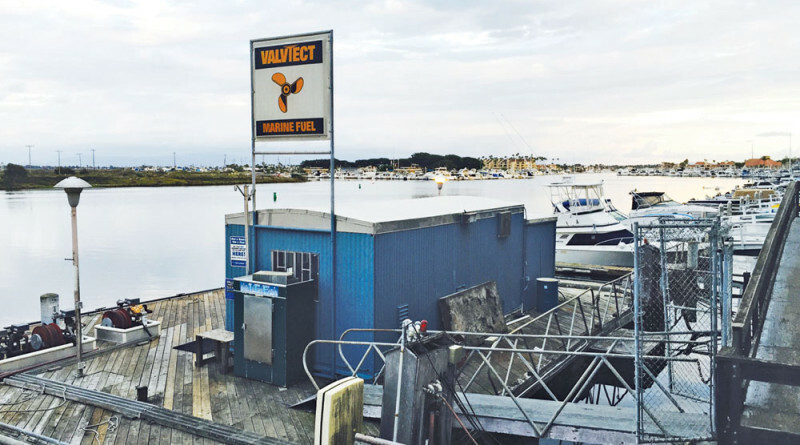 Huntington Harbour’s boaters found out in July the fuel dock’s ownership group planned to shut down Mariner’s Point by Oct. 1. Local boaters and residents expressed concern of losing the marina’s only fueling station. Boaters would have to navigate several miles out of the way to fill up at Alamitos Bay Marina, Newport Harbor or San Pedro/Wilmington. Residents argued the loss of area’s only fuel dock would result in diminished home values. City Hall announced in August it would help find a solution despite the fuel dock’s position as a private entity. Council members directed City Manager Fred Wilson to look into partnering with county officials to purchase and operate the dock. There was concern Mariner’s Point’s owners would fill the fuel tanks with cement or otherwise decommission the station in order to permanently shut down the dock. However Wilson said permits would need to be pulled from county to decommission the dock or fill the fuel tanks. Mariner’s Point ownership group would be subject to fines by decommissioning the dock or filling the fuel tank without a permit. A check of county records indicated no permits were filed to decommission the dock or fill the fuel tanks. The Sheriff’s Department uses the fuel dock daily to fill up the three boats in its Harbor Patrol fleet, according to Wilson. Navy vessels also use the fuel dock. About 6,000 boats call Huntington Harbour home.